We can all picture a super-hero with a cape flying over town to save someone’s life. These are movie and comic heroes, but what do they look like in real life? Some of them are indeed saving lives, but there is another kind: the ones overcoming life challenges and transforming them into their strengths. And that is truly brave. Markus Rehm was 14 years old when his right leg was amputated, and just nine years later he was already the long jump F44 world champion. This German athlete is a sports legend today. Two main reasons, amongst many others: he placed first in the long jump at the 2015 German Athletics Championships and, in July 2017, he won his fourth consecutive world title in the Paralympic World Championships, with an 8.00 metre jump. All his achievements would not have been possible without perseverance and very hard work. Modern material technology has also helped Markus greatly especially in his prosthetic legs that have given him not only freedom of movement, but also his nickname: Blade Jumper. 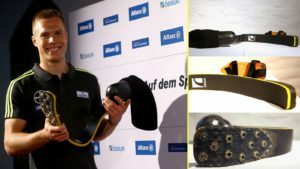 His artificial limb is made of carbon fibre and epoxy resins, a combination that gives the prosthetics the optimal design for the athlete’s height, weight and output. The materials for these prosthetics had to be wisely chosen: if it is too rigid the prosthesis will be uncomfortable and most of the energy will be lost in forcing the movements. If it is too soft, the artificial leg will flex excessively, lengthening the contact time with the track and slowing down the stroke. The setup must be perfect. Blade Jumper’s story is just one example of the many people who benefit from well-done prosthetics. Their stories are a reminder that, with hard work and a correct attitude, humans can do whatever they aspire to in life. Today’s technology will be on our side. Read the full story in Eurosport and ANSA (Translations provided by Google Translate).